South African fly-half Demetri Catrakilis kicked Montpellier to a 25-20 Top14 Rugby victory over La Rochelle on Friday. Catrakilis came into the side for the injured France flyhalf Francois Trinh-Duc and kicked seven out of seven kicks and a 20 point haul for Jake White’s team. The victory moved Montpellier into third spot in the Top 14 table after a worrying dip in form which had seen them lose to Toulouse, Toulon and Harlequins. Catrakilis, the 26-year-old former Stormers and Western Province player, only arrived at Montpellier in January but had experience of French conditions having once featured for Racing 92 in their youth squad. He was playing in just his second top-flight match, seizing the opportunity given to him when Trinh-Duc, who will leave for Toulon at the end of the season, was ruled out for two months after breaking his leg in last weekend’s 64-0 thrashing of Calvisano in the European Challenge Cup. La Rochelle got off to a flying start with a try after just seven minutes. Kevin Gourdon shrugged off the attentions of flanker Fulgence Ouedraogo before Samoan No8 Afa Amosa went over for the try which Zack Holmes converted for 7-0. Two minutes later, Catrakilis had cut the deficit with his first confident kick at goal. Gourdon was then yellow-carded for an infringement at the ruck and Catrakilis took advantage with a 30-metre penalty from out on the right to move his team to within a point. 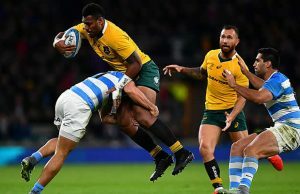 Holmes replied with a 20-metre penalty for 10-6 before Catrakilis again succeeded with his third successful kick at the posts awarded when lock forward Leandro Cedaro was sin-binned. Catrakilis put Montpellier ahead for the first time in the match at 12-10 after 45 minutes with an impressive 40-metre penalty after La Rochelle were again penalised at the breakdown. 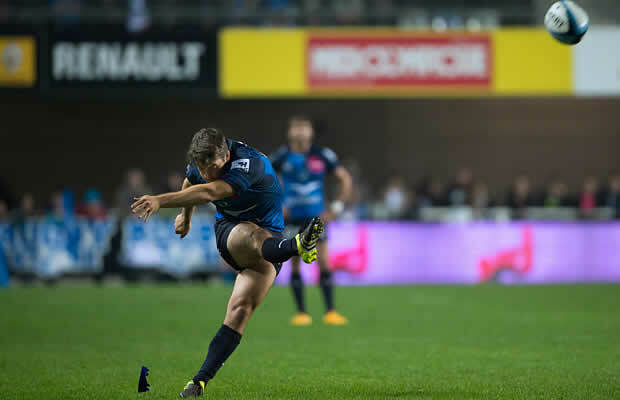 The South African soon pushed Montpellier out to a 18-10 lead with his fifth and sixth successful kicks. Jules Lebail kicked La Rochelle’s first points of the second period in the 70th minute to raise hopes of a losing bonus point. But one minute later Montpellier grabbed their first and only try when Australian back-rower Benjamin Mowen muscled over the line despite the suffocating presence of a number of defenders. Not surprisingly, Catrakilis popped over the extras for 25-13. 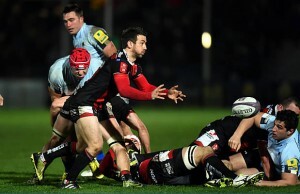 In the last minute, Georgian replacement prop Gagi Bazadze grabbed his team’s second try, converted by Lebail to at least ensure a defensive bonus point for La Rochelle.